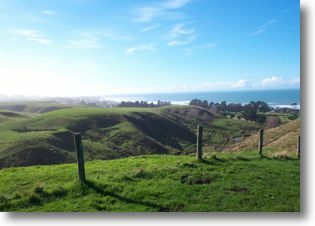 The Wairarapa region is unique for its stunning landscape, coastline, fertile soil and quality of life. The delicate balance between the maintaining of the natural environment while developing the man made environment is a responsibility that Tomlinson & Carruthers does not take lightly. Tomlinson & Carruthers adopts a synergy approach to every project we manage. The Resource Management Act 1991 states that all adverse effect should be avoided, remedied or mitigated. We strive to ensure that clients' aspirations are achieved in a way that improves the life sustaining potential of the natural and physical environment. The low visibility profile of the Hau Nui Wind Farm.When PowerCo approached Tomlinson & Carruthers to work on designing the layout of the wind turbines, access roads and the transmission lines at Hau Nui, we analyzed the potential impact on the environment and worked within the budget to design an environmentally synergetic solution. We were concerned about the potential visual impact of the erecting of transmission lines and building access roads on the landscape. We constructed computer generated models to ensure that the lines and roads followed the most direct route without being visible from the viewpoints that most people would enjoy the natural environment. PowerCo also developed streamlined power poles with small visual signatures. 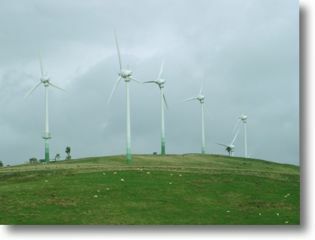 The location and design of the wind turbines presented a challenge as well. Locations for the turbines were chosen for their ability to provide sustainable generation while minimizing environmental impact. The result of the collaborative effort between Tomlinson & Carruthers and the wind turbine manufacturer is the most efficient wind farm in the world. The green to white colour scheme of the towers minimizes the visual impact on the natural contours of the landscape. Tomlinson & Carruthers has been involved in every stage of the development of Riversdale from when we first drafted the original plans in 1954. The preservation of the natural environment was the priority of each stage we managed. The isolation of the resort dictated that infrastructure was to be kept to a minimum so independent and sustainable options were necessary. People choose to live in Riversdale for its natural features so Tomlinson & Carruthers has strived to maintain what residents value. Riversdale today is Wairarapa's largest resort and yet, due partly to our design approach, the resort feels like a small, peaceful and considerate community. We have learned from Riversdale and we listen to how its residents value their unique environment. The view from one of the proposed building sites for the East Leigh Development.The natural amphitheatre of the coastal resort community surrounded by rolling countryside is a feature our firm has always aimed to protect. The successful growth of Riversdale presented many challenges for Tomlinson & Carruthers when East Leigh approached us to find locations for development in and around the Riversdale community. Before a single blade of grass was disturbed our team constructed a computer generated digital terrain model of the community and surrounding environment and designed a subdivision that literally was invisible from the existing Riversdale community and yet felt part of it. Just to make sure, we surveyed every yard of the Riversdale community and surrounding hills. We believe our team at Tomlinson & Carruthers has designed for our client, East Leigh, something very special. We took the opportunity of the development to improve the infrastructure of the whole community and do it in a way that improved the natural environment. Our experienced team has designed an environmentally synergetic and cost effective storm water and sewerage system utilizing the natural contours of the site. The construction of three storm water dams fed by an erosion resistant urban design allows the man made and natural features of the development to fuse seamlessly to provide appealing public spaces. At Tomlinson & Carruthers we pride ourselves on the way we preserve the natural environment. We enjoy the natural environment and we intend to stay that Way. 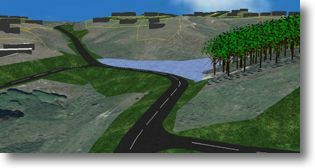 A digital terrain model of the East Leigh Development showing the use of infrastructure blended to form natural features.